TOLEDO — Chris Nell’s goaltending nearly enabled Bowling Green to earn a victory on a day it wasn’t sharp. 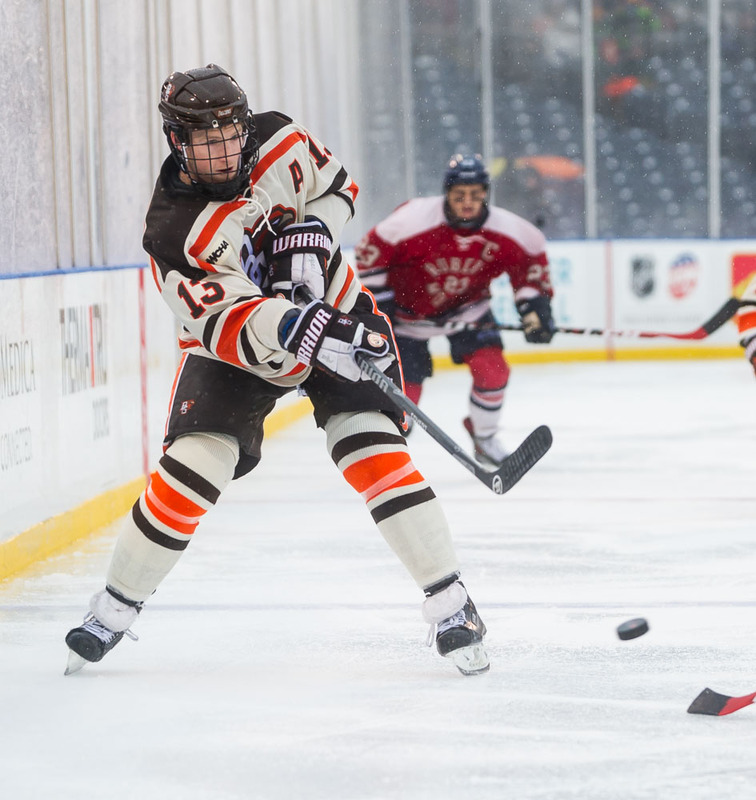 The freshman stopped 34 shots Saturday, but the Falcons couldn’t hold a two-goal lead in the third period and settled for a 2-2 tie with Robert Morris. Nell was busy over the final two periods and overtime when the Falcons were outshot by a 30-19 margin. The 6-foot-1, 178-pounder turned in some of his best work late in the second period and during the final period. Nell earned the start over sophomore Tommy Burke, although the two had split BG’s last three series before Christmas. Burke had started BG’s last three series openers. The Colonials capitalized on a BG turnover and a 2 on 2 down low to score their goals. Although RMU took advantage of BG’s mistakes, the Colonials scored with two nice plays on a day a bumpy ice surface made it tough to pass the puck. The game was played outdoors at Fifth Third Field. Greg Gibson brought RMU within a goal with 11:02 remaining, finishing a nice three-way play after a Falcon turnover in the defensive zone. Brady Ferguson tied the game off a 2 on 2 just 1:55 later. The Colonials, 12-3-4 overall, are ranked 19th nationally. No. 13 BG is 11-3-3. NELL II: Nell — who wore a stocking cap on top of his mask to keep warm — finally broke into the national leaders as he ranks fourth with a 1.65 goals-against average and third with a .945 save percentage. He leads the Western Collegiate Hockey Association in both categories. Prior to Saturday, Nell wasn’t in the national or WCHA leaders because he hadn’t played at least 33 percent of the team’s minutes. He’s played in six of BG’s 17 games after Saturday, posting a 5-0-1 record. LOST LEAD: The Falcons lost a two-goal lead for the second time in their last three games. BG held a 5-3 lead late in the second period Dec. 5 before settling for a 5-5 tie at Northern Michigan. Against RMU, the Falcons took their 2-0 lead on goals from Matt Pohlkamp at 17:44 of the first period and Adam Berkle at 17:53 of the second period. OFFENSE: BG is at its best when it’s controlling the puck and creating scoring chances in the offensive zone. Against RMU, the Falcons generated little consistent offense until the final nine minutes of regulation and the five-minute overtime. BG regained the momentum for the final nine minutes after a scheduled timeout for to clean the ice. RMU is tied for third nationally in goals per game (3.84) and second in shots per game (36.7). HEATING UP: After scoring no goals in BG’s first 12 games, Berkle has a goal in three of the last five games. Berkle’s goal finished a good three-way play with linemate Dan DeSalvo and defenseman Mark Friedman. Berkle was on the left side of the crease to fire in the rebound of Friedman’s shot from the right circle. DeSalvo’s good vision enabled him to find Friedman with a centering pass. Although DeSalvo still doesn’t have a goal this season, he has a point in four of the last six games. PENALTIES: The Falcons hurt themselves with seven penalties. Although BG didn’t allow a power-play goal, it played short-handed for 12:09 in the 65-minute game. Friedman had three of BG’s penalties, while freshman classmate Brandon Hawkins had one. PK: The BG penalty-killing improved to 92.6 percent, second-best in the country. Vermont is first at 93.2 percent. BG killed off a 5 on 3 for 42 seconds late in the first period with the game scoreless. “Seven is way too many. That’s poor decisions and poor discipline on our part,” Bergeron said of BG’s penalties. The Falcon penalty-killing is 32 of 33 in the last eight games. Pohlkamp’s short-handed goal was his second and BG’s third of the season. BG limited to RMU to just 10 shots with the extra man. The Colonial power play is at 20.7 percent. “Their power play was excellent and that’s as much abut the conditions, whether it be ice, or weather or rain or whatever,” Bergeron said. The penalties also reduced BG’s ability to play 5 on 5, and it increased the ice time of its players who kill penalties. PP: The Falcon power was 0 of 3 and had just one shot in 4:47. STREAK: Although BG settled for the tie, it’s 4-0-2 in its last six games and 7-1-2 in its last 10 games. HEALTH: BG forwards Tyler Spezia (illness) and Brent Tate (knee) returned to the lineup, and defenseman Nolan Valleau played after he banged his head in practice earlier in the week. FAMILIAR FACE: Former Falcon Mike Pikul dropped the ceremonial first puck for the game. His son, Andrew Pikul, is a freshman goalie at RMU. Mike Pikul also was the co-chair of BG’s Bring Back the Glory Campaign, which recently raised money to ensure the future of the Falcon program and Ice Arena. RANKED FOES: The BG game was RMU’s third straight against a Top 20 team. The Colonials posted a 4-2 win over No. 20 Penn State Monday and lost a 6-1 decision to No. 17 Colgate Tuesday. REMATCH: BG and RMU play Sunday night in the Colonials’ 84 Lumber Arena. The game marks BG’s final nonleague contest of the season. The Falcons finish the season with nine straight WCHA series.